The Roberts Book Holder offers hands-free convenience while reading. It holds nearly any size or thickness of book, magazine, photo album, etc. at a comfortable reading angle. The Roberts Book Holder is an ideal computer text aid or cook book holder. 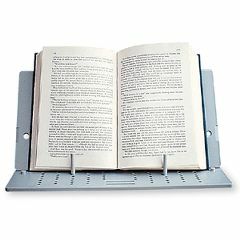 Molded of strong plastic, this book holder consists of a flat base, a backrest, and two adjustable pegs that prevent any pages from flipping yet allows for easy page turning. The book holder has a built-in handle and folds flat to a compact 7 1/2" x 14" x 7/16" (19 x 35.4 x 1.4 cm) for storage or travel. Replacement pegs are available and can be purchased separately. Afraid will lose the book. Holding pins eventually. Easy to use but loose pins will get lost. Also book rest needs to be more secure in the slots lock in. Very helpful in facilitating reading for those who have suffered a stroke and have the use of only one arm, but who love to read. A design with movable but not loose pegs would improve its usefulness--they're easy to lose track of and hard to move with one hand while holding a book upright. I will keep it, but am still using an older bookrest at bathroom sink. I read magazines and small format newspapers there. I read lying on my bed on my stomach. Will this book holder accommodate this position? This is really two pieces of junk. It can not hold a little weight book. Two plastic pieces does not worth $32!